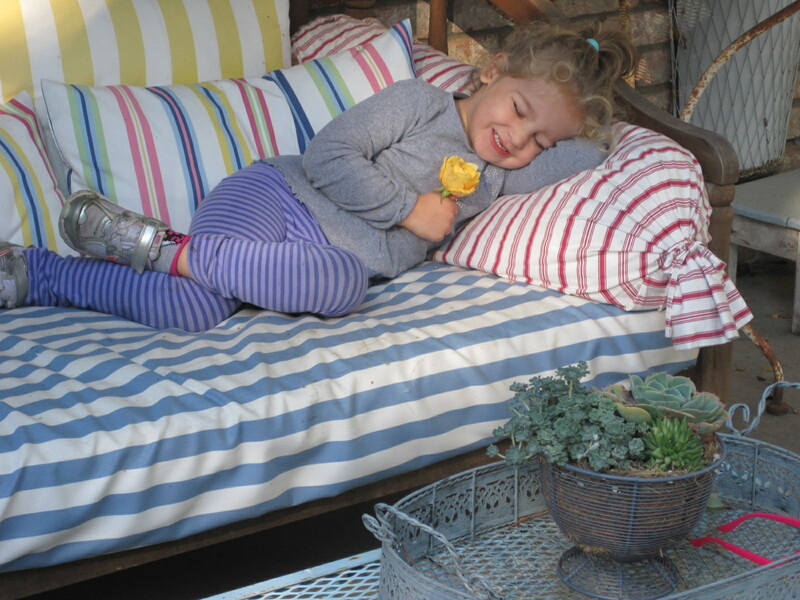 We are in Sebastopol for the weekend again, it is so relaxing and calm-ish here. Today we, my mom, John, Kennedy, and I, did a trial run of setting up my booth space for the BIG craft show (27 days away!). For those of you who are awesome and followed my 31 days to preparing for my first craft show, you saw my sketches for my booth space, for the rest of you, here is a link to the sketches. 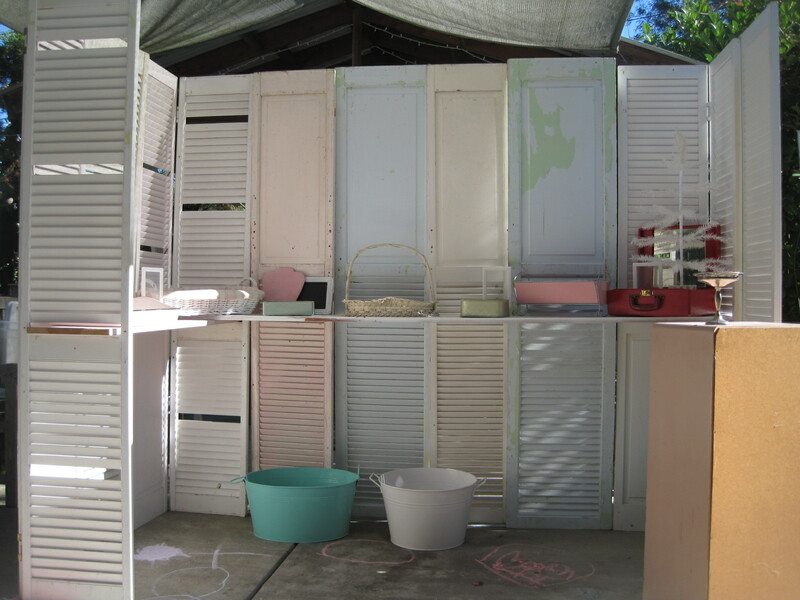 “Let’s go shopping in the shed.” My mom has a collection (yes collection) of shutters. I would guess there were at least thirty shutter options at my beck and call. We found boards for shelves, baskets, frames for signage, so much stuff. The cute things were a little tricky, not in finding the cute containers, but deciding which ones to use, this was the tricky part. My mom has TONS and TONS of super cute vintage baskets, vintage baby doll cradles, vintage satin handkerchief, jewelry and hose organizers, all things vintage, basically. The most “difficult” part, was trying to find something to use as the “paying” stand. Some sort of table, bookcase, cabinet that is tall enough to stand at, but small enough to fit into this super tiny booth. “Let’s go shopping in the house” – yes! 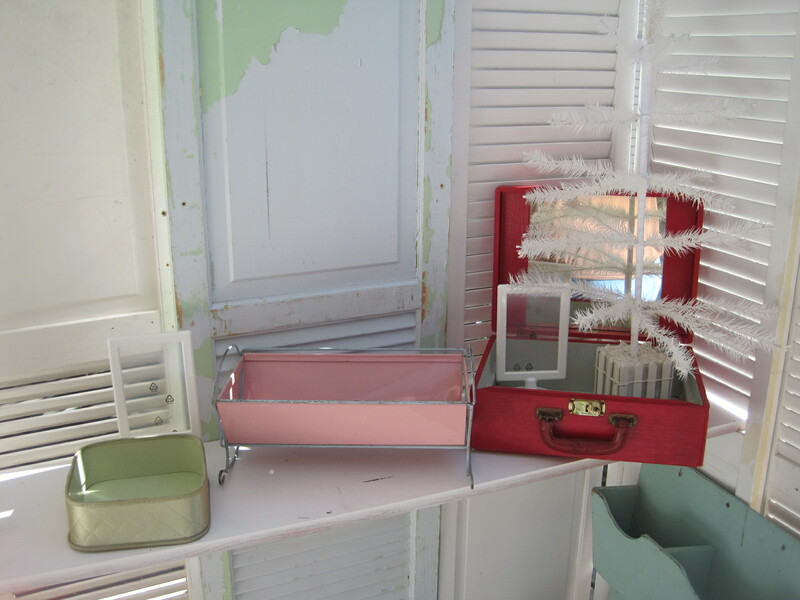 Found it, a small, tall five drawer cabinet, a pink-ish color, perfect. (It’s the piece on the right front, that’s the back side before I painted it- I went shopping in the tool room for paint). Ta-Da! Here it is, the basics for the “The Vintage Princess by M.E.” booth! Let me tell you, 4 feet by 8 feet is SMALL! Holly cow. The good thing about this, I am feeling way better about my inventory amount, the bad, it’s so freaking small! So small. close up of the “cute” stuff, vintage handkerchief holder, baby doll cradle and a super cute suitcase with christmas tree. And how fantastic is that chippy pale blue and green!? Overall, I think the booth turned out exactly like I was hoping, it’s vintage, cute and perfect. It was a fun day of “shopping,” giggling, cursing, working and sweating (who knew it would be 85 degrees in November!). Back to sewing for me or maybe a cocktail. Cheers! Pingback: I did it! « M.E.